Woonsocket, RI (September 9, 2015) – In celebration of its new 2016 calendar featuring the work of 12 local photographers, the Blackstone Heritage Corridor, Inc. (BHC) is hosting a Calendar Release Party on Thursday, October 15, 2015 from 6:00pm to 7:30pm at its offices at the Woonsocket Depot, One Depot Square, Woonsocket, RI. Guests can meet the photographers and purchase calendars on site. For the release party, BHC will place a “Golden Ticket” inside one of the calendars offering the winner a “Golden Corridor Experience” including two tickets for the Blackstone Valley Fall Foliage Train Excursion on October 24 and a gift card to dine at Ciro’s Tavern on Cherry in Woonsocket. 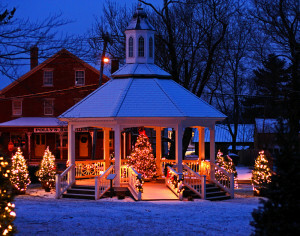 Calendars are $10 each and can also be purchased online at BlackstoneHeritageCorridor.org. “Our 2016 calendar is themed as “A Year of Celebration and Commitment,” Charlene Perkins Cutler, executive director of BHC, announced. “The Blackstone Heritage Corridor is celebrating its 30th Anniversary and we are reenergizing our commitment to protect the environment.” The 2016 calendar features about 50 different green living tips to inspire people to become stronger environmental stewards of the National Heritage Corridor. Photos that were selected best suited the themes of environment and celebration. The 2016 calendar includes the work of Chris Bilodeau from Douglas, MA, whose “Blue River” photo was perfect for January, taken on a snowy day along the Blackstone River Canal in Uxbridge at River Bend Farm. A photo of two swans whose curving necks jointly form the shape of a heart was the top choice for February’s photo, taken by Merrilyn Parry of Providence, RI. The swans were captured on the Seekonk River behind the Swan Point Cemetery in Providence, a location that many people don’t realize is within the boundaries of the Blackstone River Valley National Heritage Corridor. 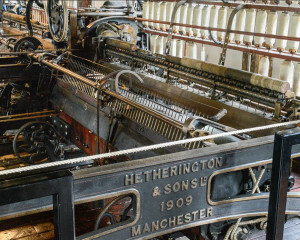 In the spirit of school field trip season, a photo of a historic spinning machine at Slater Mill in Pawtucket was selected for March, taken by Carol Dandrade of Uxbridge, MA. The sounds of spring arrive in April and a “Broad Meadow Frog” submitted by Samantha Reardon of Hudson, MA, was the perfect choice. In celebration of National Bike Month in May, a photo that captures both the base of the viaduct bridge and the bikeway bridge at the Blackstone River Bikeway in Lincoln was selected, taken by Allan J. Siuzdak of Cumberland, RI. 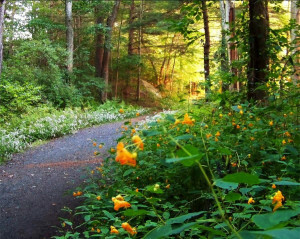 June is celebrated with more hours of daylight and Judith Belben of Hopedale, MA captured the trail at Hopedale Parkland drenched in a golden glow with blooming flora at the trail’s edges. With a nod to the 4th of July, “Sutton Remembrance,” taken by Andrew Davis of Sutton, MA, will grace the month of July. The photo features a Civil War-era cannon being towed by Bob Largess and his team of Belgian Draft Horses in a field covered with American flags planted like flowers. Donald E. Perkins of Webster, MA, captured a beautiful reflection of the River Bend Farm Visitor Center (Uxbridge, MA) in the deep blue water of the nearby canal; the stunning photo was selected for August. The landscape starts to change in September with the colors of fall and Michael Korba from Johnston, RI, captured a Common Green Darner on display in Smithfield, RI, attached to a beautiful piece of foliage. In October, many homes are decorated for the Halloween season and one particular home on Sagamore Road in Worcester was captured in the evening with illuminated pumpkins, making it a clear choice. This photo was submitted by Troy B. Thompson of Worcester, MA. Frances Guevremont of Lincoln, RI, captured the Blackstone River Bikeway on a day that looks like November with its leafless trees and crisp blue sky and was selected for that month. 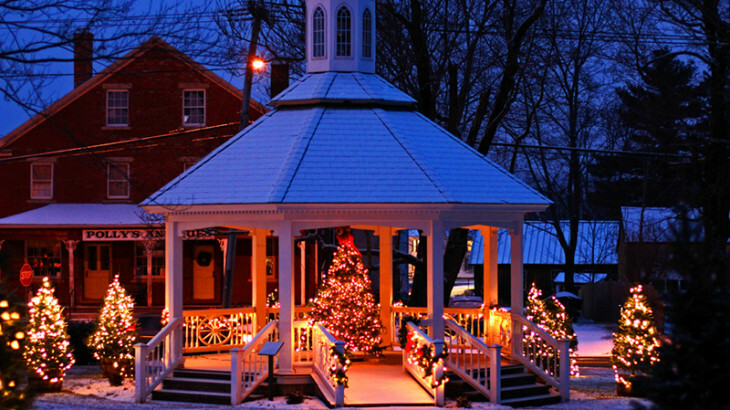 And finishing out the year with December, Bob See of Sutton, MA, submitted his photo of the Sutton Gazebo decorated with white lights that give a cold winter’s night a warm holiday glow. The coveted cover shot was submitted by Chris Bilodeau of Douglas, MA, and truly captures the essence of the Blackstone Valley. “One Main” was taken at sunset at the Whitin Mill Complex in Whitinsville, MA, with the Blackstone River flowing over a dam, representing the natural energy source that powered the mills. The vibrant colors and mill heritage subject truly celebrates the 30 years of the Blackstone River Valley National Heritage Corridor. The Blackstone River Valley National Heritage Corridor is a unique cultural landscape of industrial history and immigration in the interconnected system of the Blackstone River watershed. An energetic nonprofit, the Blackstone River Valley National Heritage Corridor, Inc. partners with organizations, local communities and businesses, and residents to insure the long term vitality of the Corridor.